From chariot racing in ancient Rome to the modern Kentucky Derby, horse racing has been celebrated in some form for more than a thousand years. Whether the horses' hooves were pounding around in a dirt-filled coliseum or a racetrack surrounded by spectators in wide-brimmed hats, they probably had one thing in common: asthma. When just a few seconds makes the difference between first and last place, equine athletes need to bring their best game to the track. For those that don't, the issue can often be traced to the lungs. "Unlike the heart or muscle, the lung in the horse athlete is a limiting factor," said Laurent Couëtil, director of Purdue University's Equine Sports Medicine Center. "Even in healthy horses, breathing is a limiting factor on performance. So if you take a little bit away from that, the consequences can be severe." Couëtil, who is also a professor of large animal internal medicine in Purdue's College of Veterinary Medicine, has spent much of his career treating and researching equine respiratory disease. However, it wasn't until 2016 that "equine asthma" was an official diagnosis, when Couëtil collaborated with three other researchers to argue for the adoption of the term in the Equine Veterinary Journal. But Couëtil has contributed to far more than terminology. Over the last two decades, his research has created a better understanding of scope of the disease and even invented a new way to diagnose it. 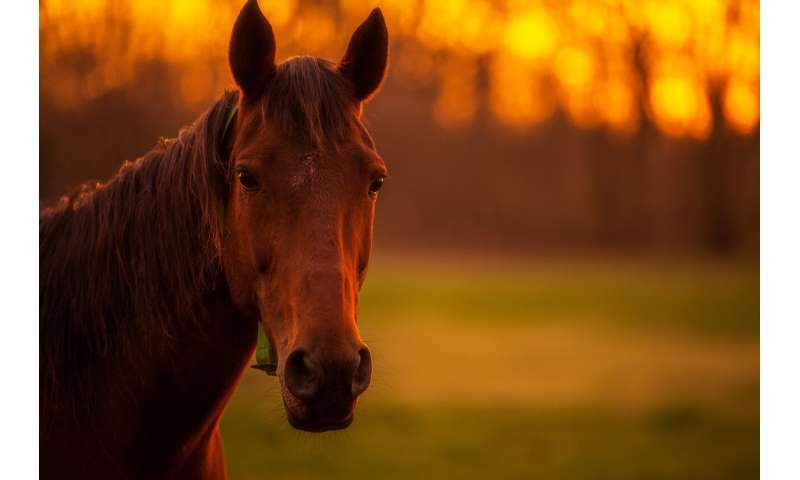 "Milder equine asthma has been difficult to detect because horses don't necessarily show many signs besides the fact that they're not performing well. Some of them cough once in a while, but it isn't crippling them," Couëtil said. "Now that we have the tools to look for it, we realize it's very common." A 2018 study led by Couëtil found that 80 percent of the thoroughbred racehorses surveyed had mild or moderate asthma. The results, which were published in the Journal of Veterinary Internal Medicine, show that the worse a horse's asthma, the worse their performance. To test for equine asthma, veterinarians use variations of methods developed to measure lung disease and dysfunction in humans, such as the bronchoalveolar lavage and lung function test. However, some of these tests are not commonly done or impossible to perform on horses. To address this, Couëtil developed a new method. "In humans, the most common test performed to test for asthma is forced exhalation. The nurse trains you to take in the deepest breath possible and blow out as hard as you can," he said. 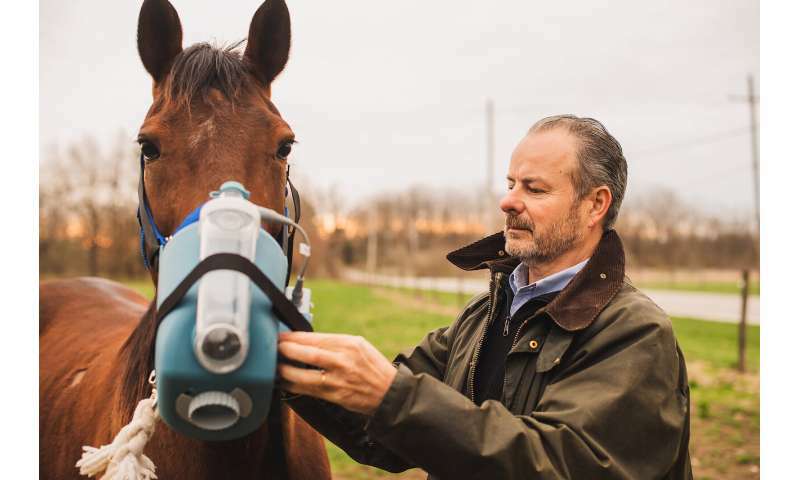 "This is easy for people because we can follow instructions, but you can't tell a horse to do that, so I worked with Purdue engineers to develop a pulmonary function test for horses." The test uses a mechanical ventilator to control a sedated horse's breathing. A series of tanks, using positive and negative pressure, help mimic deep inhalation and exhalation. During the process, a computer records data about the patient's lung capacity, expiration volume and expiration flow. This system is the only one in the world capable of performing such a test, and it's extremely sensitive, detecting even very mild asthma. Now that he knows how to diagnose the disease, Couëtil wants to be able to treat it. Severe equine asthma is typically treated with corticosteroids, which come with a risk of drug violations in racehorses, suppress the horse's immune system, and may result in life-threatening infection or founder. Couëtil's research shows that the causes of equine asthma are largely environmental. Some breeds have a predisposition, he said, but thoroughbreds (the most common breed of racehorses in the U.S.) aren't one of them. The biggest risk for the horses he works with developing asthma is a dusty environment, which can be difficult to avoid for an animal that lives outside and eats mostly dried grass. For a recent study, Couëtil worked with Purdue researchers Katy Ivester, Carla Olave, Emily Hess and Kylie Zehner, and technician Laura Murray, to equip horses at a racetrack with sensors near their noses to measure how much dust they were inhaling. Horses wore the sensors while going about their daily business, and the findings show that most of the dust they inhaled was coming from hay. "We know dust is the problem, but now we're trying to figure out how to reduce it. In our next study, we're testing different types of hay to see if we can reduce the amount of dust horses are coming into contact with while they're eating," Couëtil said. Some horses will be fed steamed hay, which incubates in a sauna-like case for an hour before being fed to horses. The final product is a little wet, but the process kills much of the mold and dust that accumulates in bales of hay. Other horses will be fed baled silage, or haylage, which is hay baled at a higher moisture content than dry hay and stored in a tightly sealed plastic wrap (like wet dog food, but for horses). "The horses that were fed the supplement improved much quicker and to a much greater extent. Many of them stopping coughing within a couple weeks," Couëtil said. "The next step for us is trying to understand the mechanism that makes that happen."